I’m quoting oyster extremists. But perhaps I’m mistaken; perhaps there is a middle ground. You may be an oyster waffler, unsure about your relationship with this inimitable mollusk. If you fall into this category, consider this: Oysters, loaded with zinc, potassium and omega-3 fatty acids, deliver a whopping nutritional punch. One way to ease into oysters is by first enjoying them cooked. 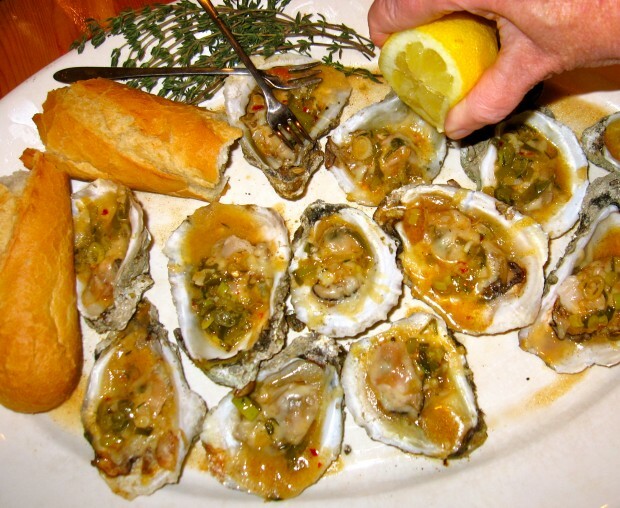 The following recipe is adapted from a favorite grilled oyster recipe served at New Orleans’ Acme Oyster House. I purchased Apalachicola oysters from Florida, and my brother agreed to shuck them if my sister-in-law grilled them and I made the sauce. Deal! This oyster fetish of mine is, no doubt, genetic. I’ve observed in other family trees, as well, the oyster doesn’t stray far from the shell. A freshly baked baguette, essential for mopping up the savory oyster juices, a crisp white wine, and a copy of “The Moveable Feast” (for inspiration) would be appropriate oyster accompaniments. Happy New Year! Melt butter over medium-low heat in a medium-sized saucepan. Add scallions and cook, stirring occasionally, 4 minutes or until just tender. Add garlic and Creole seasoning and cook an additional minute. Add lemon juice, Worcestershire sauce, wine, thyme and pepper flakes to pan. Simmer gently until wine is slightly reduced, about 5 minutes. Remove from heat and cover pan, to retain warmth. If using oven: Preheat oven to 400 degrees. Place 4 cups rock salt on a sheet pan with sides and spread evenly. Set oysters atop the salt and place on middle rack of oven. Do not jar oysters and keep as much oyster liquor in shell as possible When the oyster liquor starts to bubble slightly, after 6-8 minutes, remove from oven and divide Romano over oysters. Return to oven and continue baking until cheese has melted and oyster edges are beginning to brown, about 2-3 minutes. 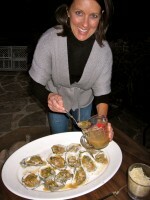 Remove from oven, divide and spoon Creole sauce over oysters, and serve. If using grill: Preheat gas or charcoal grill to medium heat. 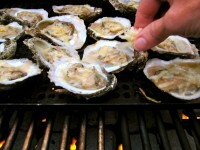 Carefully place oysters on grill (using a grill pan is helpful); do not jar oysters and keep as much oyster liquor in shell as possible. When the oyster liquor starts to bubble, sprinkle Romano over each oyster. Let cheese melt. When oysters begin to slightly brown at the edges, remove. Spoon sauce over each oyster and serve.